Our cultural interaction dematerializes more and more into digital data. Distributed-ledger-technologies, such as the blockchain, enable consensus-dependent applications like cryptocurrencies or smart contracts in digital environments, with Bitcoin being the first and most popular example. Watch the Video von Vimeo. ON BRINK is a physical data visualisation of the Bitcoin blockchain: Adapting the mining metaphor, it encodes data on blocks appended to the chain in real-time. It produces piles of soil that relate in size to the number of transactions within a block, and displays six of them at a time on a continuous conveyor system, thus reflecting the human attention span given to a transaction on the blockchain: A transaction counts as confirmed after five blocks have been appended to its containing block. A display informs about the latest block appended to the chain. As the passed blocks accumulate to a growing pile at the end of the conveyor system, the initial pile of soil keeps decreasing: our digital tools are strongly dependent on physical resources. 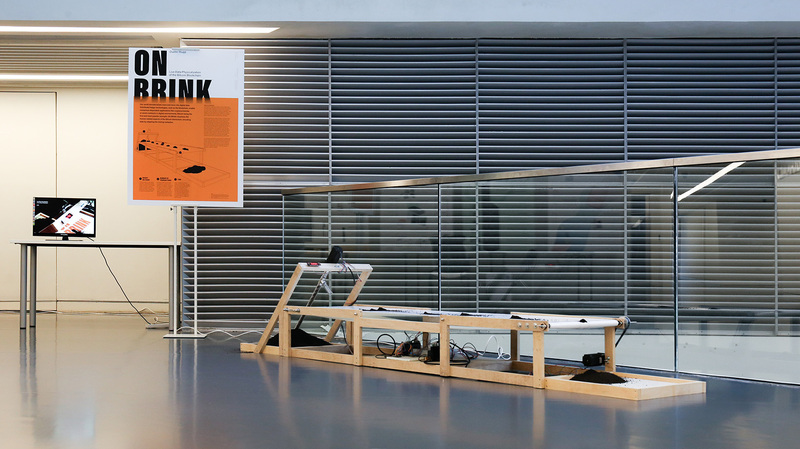 ON BRINK relates our digital to our physical environment by physicalizing the human-related data points of time, location and participation of the Bitcoin blockchain.